This video-essay analyses Steven Spielberg’s films. It covers his career from his first TV movie, Duel through to his most recent works, Tintin and War Horse. Along the way we examine the various techniques he has developed over the years; from his first blockbuster Jaws, on through his remarkable run including ET and The Indiana Jones Series, and his Oscar winners, Schindler’s List and Saving Private Ryan. The essay shows the directors who have influenced him; John Ford, Victor Fleming and David Lean, before finally offering an examination of his recurring themes. This is brilliant . I love how you mentioned how he moves the camera . That is something I’ve always loved about his work . You articulated it so well . There’s so much more going on in his shots than people realise. . Thanks for making this . Thank you very much for the generous compliment. It amazes me how Spielberg can take a scene and give it movement and hence, elegance while other filmmakers would only have a static scene. I hope you check out the other video-essays I’ve done; there are pieces examining Silence of the Lambs, Blade Runner and Inception. Right now, I’m working on a fun short piece about dance and action sequences. Thanks for visiting the site. Be sure to click on the podcast page. There are over a hundred podcasts each with short supplementary articles. If you don’t mind I’ve put you on my email circular which I send out each week letting everyone know what is soon to be appearing on the site. I assume you caught the link on this very popular website, kottke.org, though ufortunately it does not really link to your own site and so you probably don’t get all the kudos you well deserve. Terrific analysis and less common than one might expect given that vlogging, blogging, Vimeo etc are ideal for this sort of detailed criticism that shows as well as tells. Thanks for the compliments on the essay. Yes, I noticed that the Spielberg essay suddenly got some traction. I checked out kottke.org but it appears that the recent surge in interest came earlier from a tweet sent out by Annapurna Pictures on May, 8th. Funny the way it takes just one person to see something and then, boom, a whole lot of other people are interested. That’s the internet for you! I’m currently studying Steven Spielberg for my Alevel Film Studies and your video truly captures Spielberg in a way many others don’t. i can’t thank you enough for this video as there are so many techniques you mentioned where you have gone into such brilliant detail. Many thanks Georgia, for your generous words. 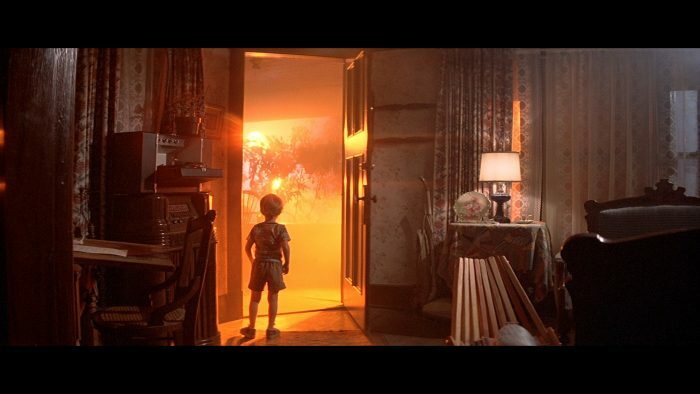 I really enjoyed assembling the essay simply because I have always enjoyed Spielberg’s films (the first one I saw was Close Encounters of the Third Kind). But it was only by doing the essay that I was able to understand why I enjoyed his films so much; he weds the information (narrative) to the emotion (technique). Simply one of the greatest artists cinema has ever seen. Dear Steven, I loved this video-essay. So full of information, it left me wondering: is there additional reading material you can recommend in this line? Specially related to the subject of how cinematography techniques relate to the presentation of information, emotions, etc. I would love to read your recommendations regarding books on EDITING as well. I am working on a short film, and for years your podcast has been my main source of reflection and learning on this beautiful art. Greetings from a fan in Paraguay! Thank you for your email and thank you for your generous compliments. A lot of what I said in the essay I had figured out by watching Spielberg’s films over and over and over. There are so many books on him, only a few really stand out. THE CINEMA OF LONELINESS by Robert Kolker. It is mostly about American cinema in the 70s and focuses on Robert Altman, Scorsese, and Kubrick. A chapter is devoted to Spielberg (The Politics of Recuperation). And another good one is POSTMODERN AUTEURS (Coppola, Lucas, DePalma, Spielberg and Scorsese) by Kenneth Von Gunden. Then there is an interesting biography on Spielberg by Joseph McBride. As for editing. I always, always, always recommend IN THE BLINK OF AN EYE by Walter Murch. Best of luck with your short film.